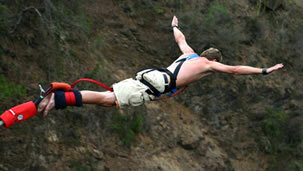 Breathe, Forget and ... Jump! If you're the kind of person that enjoys adrenalin-packed, nerve-challenging experiences, then why not brave a morning wake-me-up in Middlesbrough where you can bungee off Middlesbrough's iconic Transporter Bridge! 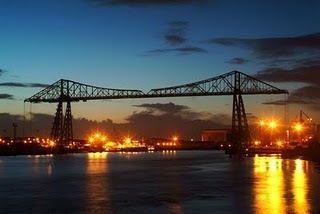 Built in 1911, the grade II listed Transporter Bridge is one of Middlesbrough's most famous icons. Spanning the River Tees, its gargantuan structure is the tallest example of its kind in the world, is one of the only 'gondola' bridges in the UK and now one of the only UK bridges licensed for bungee jumping! No wonder the bridge is a celebrity in its own right. Over the last couple of years the Transporter has featured in Auf Wiedersehen Pet, Billy Elliott and the Fast Show. Jumpers who take up the bridge bungee challenge get to walk 210 steps to the top of the bridge and take in expansive views across the Tees before leaping 160ft to the river below. This is described it as 'the ultimate mettle challenge'! The Transporter Bridge isn't just attracting thrill-seeking bungee enthusiasts from across the UK. In December 2007 American TV Presenter, Ann Curry, jumped off the bridge for charity, egged on by Hollywood superstar Tom Hanks! Ann decided to jump off the Transporter because of the lack of 'bungee bridges' on the USA's east coast. I am not so famous and that doesn't matter. I just want to jump on the 11th June. I will jump this Saturday 11th June only for my Love Jacqueline and to carry on my fund-raising for the Royal Hospital which is caring of her. After finishing the London Marathon, it's a relief. You have done so much during months, training in the cold, in the snow, in the ice, in the dark, that you think this is the end and you will be able to rest. But at this time, it was not enough, and I wanted to do more for Jacqueline. The London Marathon was an achievement 12 years after my first marathon, but 3 days after I was already entering the New York Marathon which be held in next November 2011. Then my friend Mike Shattock reminded me he joined the bungee jump in Middlesbrough, so I decided to join myself, and this was also an echo to the next challenge planned with Andrew, Jacqueline brother, to jump in tandem parachute over North Yorkshire, in July or September. All along the next months, I will still carry on training for the New York Marathon. Trying to extend slowly distance, and repeat training session, LSD... Longer, Slower, Distance. I am still doing ice bath after hard training session or long session, but also a lot of massage which helps to heal quickly sore muscles. I hope you will carry on to support my fund-raising, that you will talk about it around yourself and perhaps join me for the jump! ?